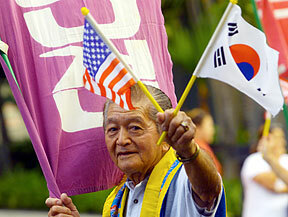 The Korean American Foundation Hawaii will celebrate the arrival of Koreans to America on Saturday, the anniversary of Korean immigration in 1903. The commemorative ceremony will be held from 11 a.m. to noon at Pawaa Park on King Street. Local and Korean community leaders will speak. Dancer Kim Mi Suk will perform and refreshments will be served. The event promotes understanding and appreciation for Korean culture, history and heritage. A 12-inch water main break fronting 249 Keahole St. left several customers without water and backed up traffic in Hawaii Kai yesterday about 3:30 p.m.
At 9:30 p.m. last night, crews were still repairing the main that made a hole in the road, partially closing it to traffic. The cause of the break was still undetermined, a Board of Water Supply supervisor said. A few customers were still without water, but the majority had water service returned within a couple hours after the incident, the supervisor said. The main was expected to be repaired by today. Firefighters responded to what they believe was a deliberately set fire at a vacant building near the 7-Eleven store in Hauula. At about 12:44 a.m. yesterday, about 30 firefighters responded to a building alarm. The fire was under control about 30 minutes afterward, said Capt. Gary Lum, acting spokesman for the Honolulu Fire Department. No injuries were reported, and firefighters estimate about the blaze caused $20,000 in damage. Four people were arrested early yesterday morning for allegedly breaking into a car in Waikiki, police said. At about 12:55 a.m. yesterday, a witness called 911 after seeing a boy, whose age wasn't released, and an 18-year-old man removing property from a 30-year-old man's car. The two left in a pickup truck. Officers checking the neighborhood pulled over the pickup truck, and arrested the two, as well as two 22-year-old men in the pickup, on a charge of unauthorized entry of a motor vehicle.